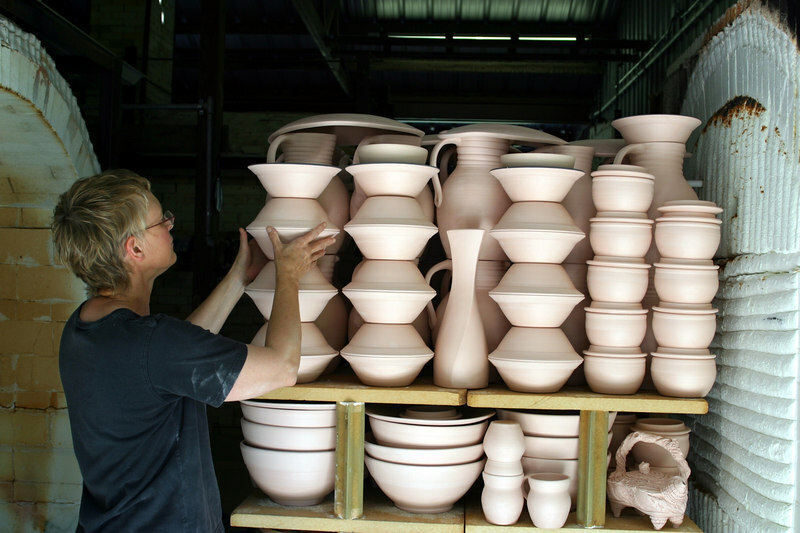 Daphne shares her studio, Pine Mills Pottery, with her husband, Gary C. Hatcher. While they share the same clays, glazes and kilns, each work independently of the other. Daphne primarily handbuilds, often with clay she has taken into the surrounding forests and textured with tree bark. Daphne fires a 45 cubic foot propane-fired kiln and a 120 cubic foot wood-fired Bourry Box kiln, both in reduction to cone 12. Unloading bisque from 45 cubic foot propane fired car kiln. Cone 12 reduction glaze firing is also done in this kiln.